Click here for links to some of Lucy’s favorite and auto-buy authors. Visit Lucy’s YouTube channel to see her book trailers and latest podcasts. 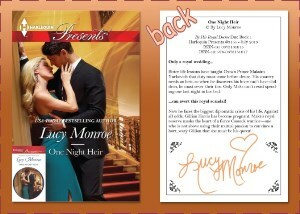 Lucy wrote for 9 years before she published The Greek Tycoon’s Ultimatum with Harlequin Presents. She shares her “getting the call” story here. Lucy loves to sign books for readers, but not all readers can make it to author signings (and frankly, Lucy does very few of them). Also, many readers are now buying eBooks. So, Lucy started searching for ways to provide her readers with “signed” books, even electronic books. with a personal message. See a sample. These 4×6 book cover postcards with personally signed backs are sized to fit in the Keeper Kases designed by NYT bestselling author Dianna Love. Whether you collect book covers, or simply want a signed cover postcard to go with your favorite eBook by Lucy Monroe, the following cards are available. Please email Lucy for instructions on how to get your signed book cover postcards.